If you ever doubt how much can be gleaned from even the smallest scraps of information left by your ancestors take a look at the piece of paper my mother received in the 1950s in a bundle of family papers collected by an aunt. Aunt Alice was a young girl when her grandmother, born Charlotte Heap in 1808, died in 1890, but her grandmother had noted fragmentary details of the family story of an ‘Indian Princess’ and from this eventually grew a database of several thousand close and distant ancestors, and my book A Parcel of Ribbons. One common, but frustrating, genealogical puzzle comes when you are given only the surname and no first names and this is especially acute if you are tracking through the female line of your family with surname changes every generation as in this example. In the end I came at this problem from two directions at once, both working backwards from Charlotte Heap and also looking for two sisters surnamed Jaques, one who had married a Lee and another a Marleton (in fact spelled Marlton). Another problem with handwritten notes is interpreting connections without a diagram or helpful punctuation. For example ‘his father married a creole’ in the above example could apply to Richard Lee or to Richard Lee’s father or his grandfather. Another piece of paper written by Aunt Alice said that her father had referred to a creole but she had always heard ‘Indian Princess’. I had very little to go on geographically other than that the family was based in England, Charlotte was born in Kendal in Cumbria but her mother came from Suffolk and it emerged that the roots were all in London. Without the internet and computerised indexes the search would have been all but impossible. Two key findings helped in unravelling the story. One was a marriage licence issued in 1720 for Joseph Lee and Frances Jaques (I have still not found the marriage record), and the later discovery that Frances’s sister Mary had married Thomas Marlton. 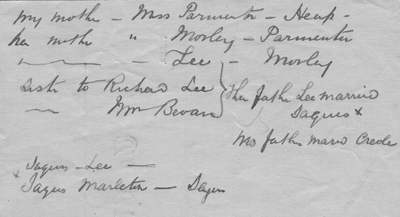 The other was the combined information from the Will of Richard Lee in 1857 (which left a small legacy to Charlotte and various members of her family) together with the 1851 census record for Richard Lee giving his birthplace as Jamaica. This last was a total surprise, since until then no-one in the family had any idea there was a Jamaican connection. Indeed in a family with slight connections with North America and extensive ones from the early eighteenth century in India, the search had been on for either a family Pocahontas or the daughter of an Indian Rajah! I think there are two lessons to be drawn from all of this. The first is always to take seriously any information your ancestors leave whether as stories or documents. The second is, that having taken it seriously, don’t be surprised if what you find is not at all what you expect. Indeed over the passage of time (Charlotte’s notes were made in the late 1880’s and referred to events nearly a century before she was born) a kernal of truth may well have acquired an auro of myth by the time it comes down to you.